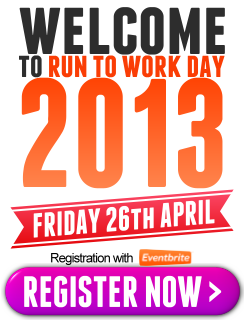 We are really excited to bring you details of the first global RUN TO WORK DAY on Friday 26th April 2013. This is an event that encourages us all to run to or from work on one day of the year and donate the money we would otherwise have spent on travel and parking to a good cause. It’s absolutely FREE to register online to be part of RUN TO WORK DAY. By pledging to run you will be eligible for various rewards and incentives and receive ongoing advice and tips on how to prepare for your run and track your route. Unlike other running events there is no fixed or minimum distance to cover. You can pick your own route, distance and time of day plus decide if you want to run solo or with a colleague. If you have a long work commute perhaps you could plan to run just part of your travel distance by committing to get off the bus, train or underground a stop or two earlier than usual. RUN TO WORK DAY in not just an opportunity for runners around the world to ‘run for good’ it is also a chance for employers to encourage colleagues to create a healthy and active workplace. Further, we anticipate that many firms will agree to match-fund their employees’ charitable donations. We encourage you to participate in RUN TO WORK DAY 2013 in support of Right To Play, a global organisation that uses the transformative power of play to educate and empower children facing adversity. Just £5 will put a child facing poverty, conflict and disease through a sport and play programme for 2 months, giving that child the chance to learn and play. 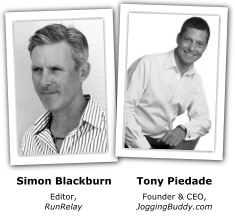 Simply taking part in RUN TO WORK DAY will make a massive difference to many children's lives. (See Charity page for full details). To donate your travel money to Right To Play simply click on the Virgin Money Giving link at the foot of this page. You can, of course, participate in RUN TO WORK DAY to support a charity of your choice should you prefer. On RUN TO WORK DAY, and for a period thereafter, you will be able to send us your photos, videos and stories to be featured on the event website. By uploading your personal route we aim to calculate the total distance run for good by city, region, country and worldwide on RUN TO WORK DAY. RUN TO WORK DAY engages both employers and staff by combining health, fitness and charitable giving in a simple yet unique way. 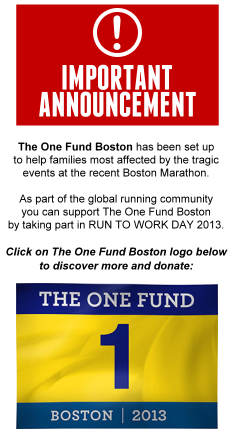 Join with fellow runners and pledge to make a difference by signing up today.